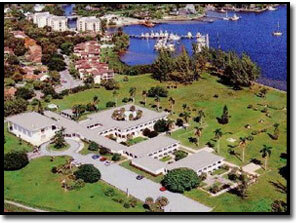 The Saint Camillus Men's Retreat honoring Tommy T. is located in North Palm Beach, FL. 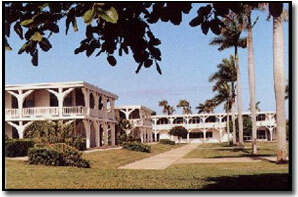 The retreat is open to men recovering from addiction through a 12 Step Program. 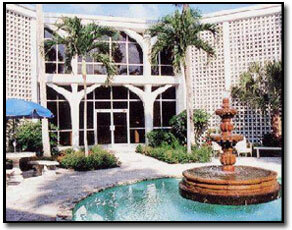 The retreat is situated on the Our Lady of Florida Spiritual Retreat Center. It offers the ideal setting for a retreat. Our mission of spreading the Word of God is addressed to all in the wider ecumenical community. The impact of this striking place is one of contemplation and spiritual uplift, as the visitor walks through the beautiful gardens leading gently down to scenic Lake Worth. The Passionists are intended to be intense contemplatives and prayerful apostles. The Spiritual Center supports our mission by providing a peaceful and prayerful environment, open to the world and to the people who come here to share the life of the Passionists. Featuring 75 single rooms, two large conference rooms, two lovely chapels and an enclosed fountain garden, the Spiritual Center provides the perfect environment. In conducting our retreat programs and in hosting other events, we strive to be open and hospitable to the needs of all people in their quest for truth, and in their faith journey. The retreat begins with dinner on Friday, August 15th at 6:00 p.m. and concludes with lunch on Sunday, August 17th. Registration begins mid-afternoon on Friday. Private rooms and all meals are provided. We would like a donation of $185 per person. A deposit of $85 is required by March 1st and the $100 balance will be due upon arrival. If you truly cannot afford this amount, contact a retreat promoter from the list below. Arrangements will be made for you to attend. Registration is limited, so please reply with your deposit as soon as possible.